Today marks the first Nar Shaddaa Base Medal of Yavin awarded. It is the first of what I hope will be many. These medals will be quietly awarded in private, and sometimes even mailed. 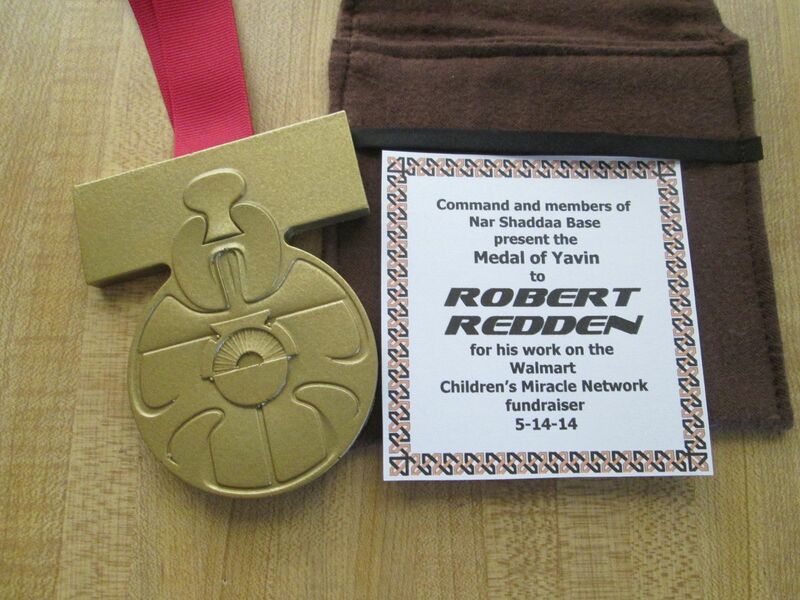 The medals are a small token of our appreciation for extra efforts in supporting our Base. 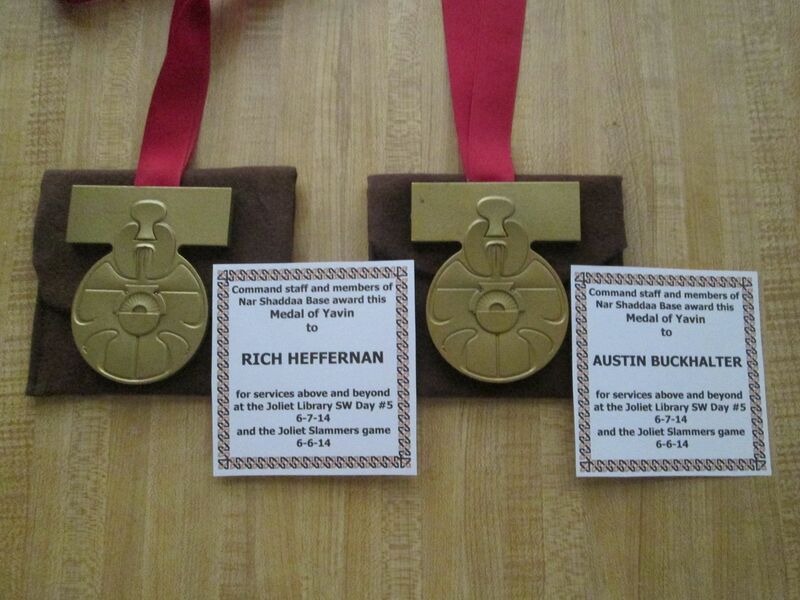 Each medal is hand made using the "cast magic" process from Smooth On and since this process renders each piece a little different, they are all truly one of a kind. Even the pouch is hand made. The medals are for effort above and beyond and will not be awarded lightly. Robert worked on the logistics for this event with store management, got additional volunteers and store staff to participate in crowd control, photographing and facilitation. Robert also built a backdrop for the event and handled the sign up and refreshments. This event raised almost $600.00 for Children's Miracle Network and had many other Walmart Stores scrambling to try to top that. 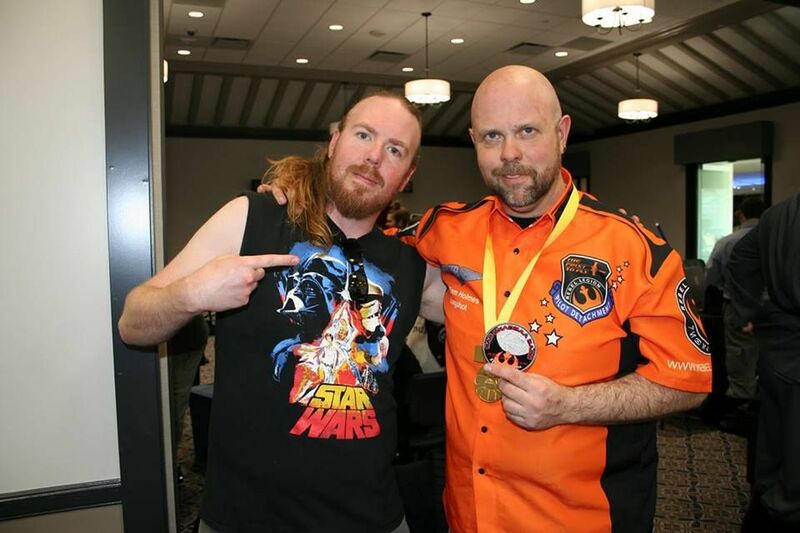 For John Hartley and Nick Klein the NSB Medal of Yavin is for their years doing lightsaber demos for not only JLSWD but also for the Milwaukee Discovery World events. 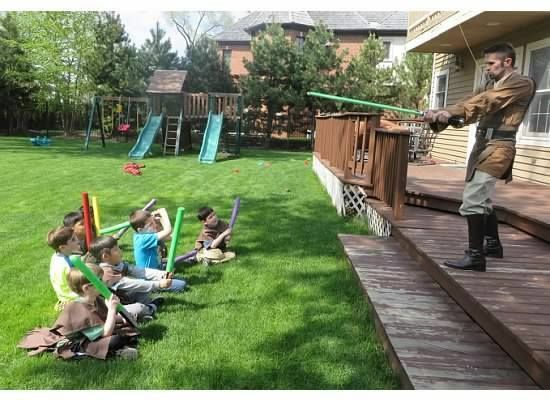 These lightsaber battles are not just a "show up" sort of thing. John and Nick lay out the battle on paper first and then put it into motion. They spend hours and hours in rehearsal in order to make their performance as flawless as possible. While others may be able to go out and wander the venue, John and Nick are more or less tied to the auditoriums for their performances. They do multiple performances at each event and not just one. Also, each year for each event they change things up so that repeat "customers" always see something new. You have given the Base such a wonderful gift of your passion for Jedi, Lightsabers and the art of the Sword. 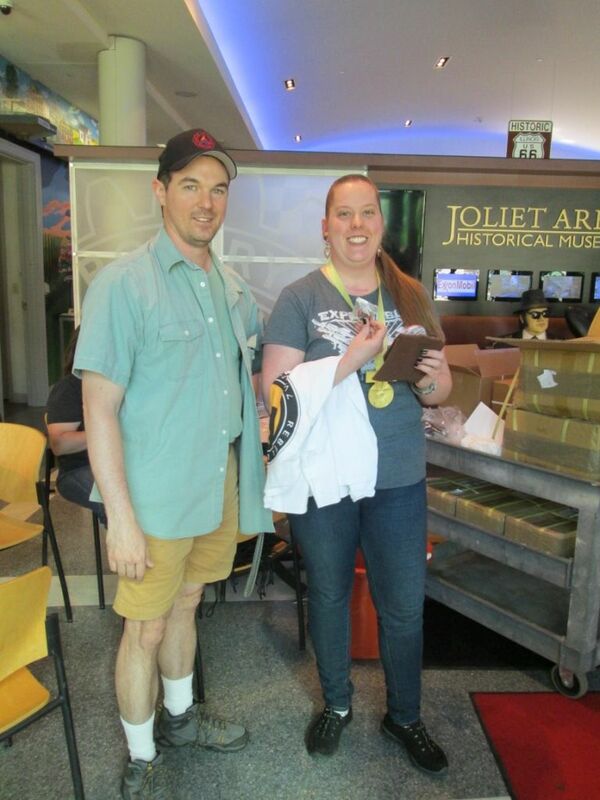 Your performances have been ranked as the top attraction for the Joliet Library event. Your performances have also raised a great amount of money over the years for Make A Wish and for the American Diabetes Association. You don't necessarily have to be a member of NSB to be recognized for above and beyond. These two medals are headed to Evansville IN. Donella posts here as Swfangirl. 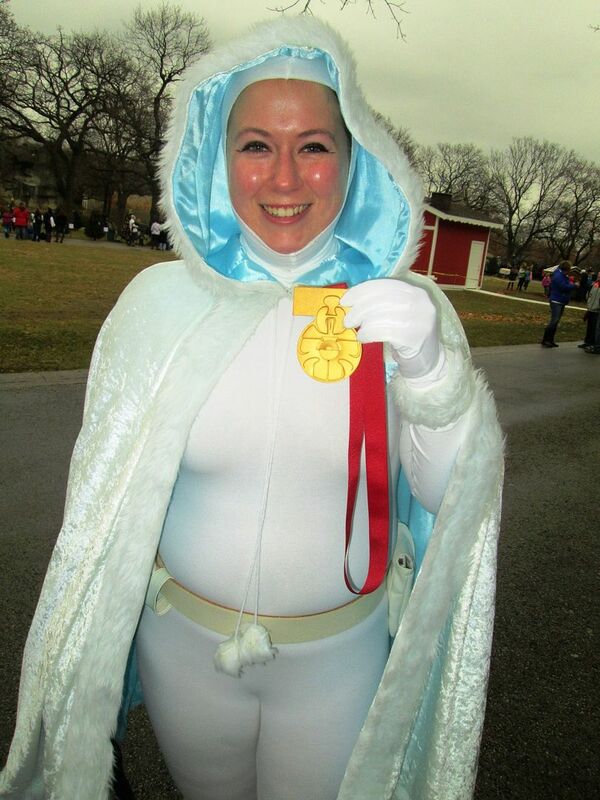 The medals are not only for the Slammers game and the JLSWD but also for the Chicago Thanksgiving Day Parade. 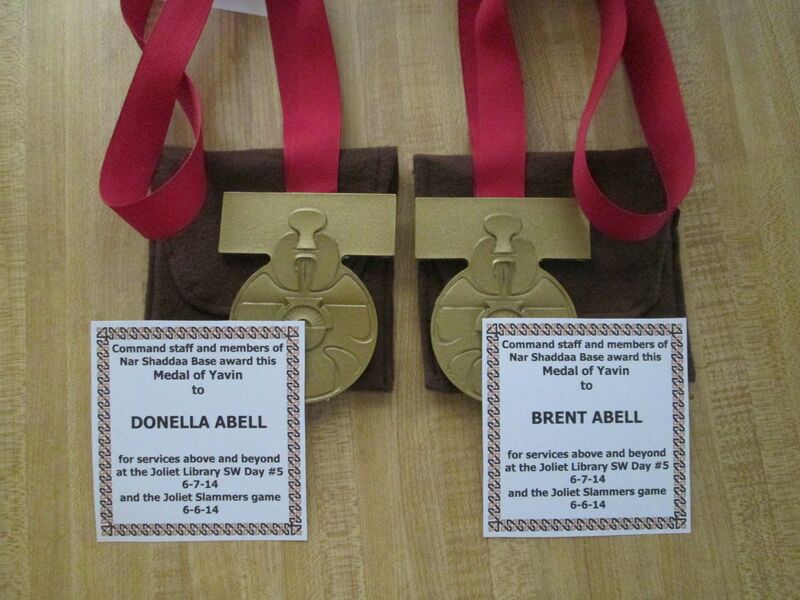 For the JLSWD event, Donella and Brent were actually coming in from Iowa on the Friday before the event. They saw that we were rather desperate for members for the Joliet Slammers game the night before the Library event and decided to come and help out. So after being on the road most of the day, being caught in the hell that sometimes is traffic on the Interstate they were running a bit late. 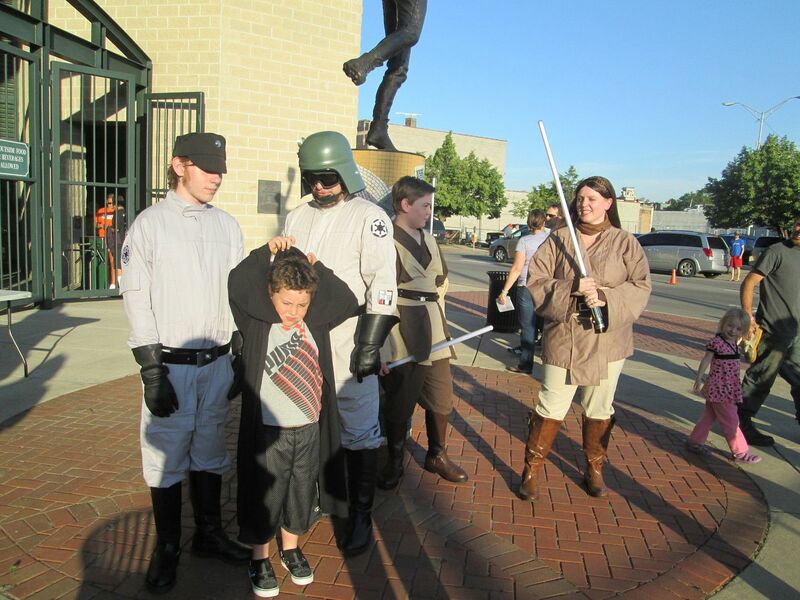 The Joliet Slammers event was one that was more or less "sprung" upon us last minute by the City of Joliet. The Abell family could have gone to their hotel to relax, but they instead hustled to Silver Cross Field, suited up themselves and their family and came out to sweat with the rest of us. 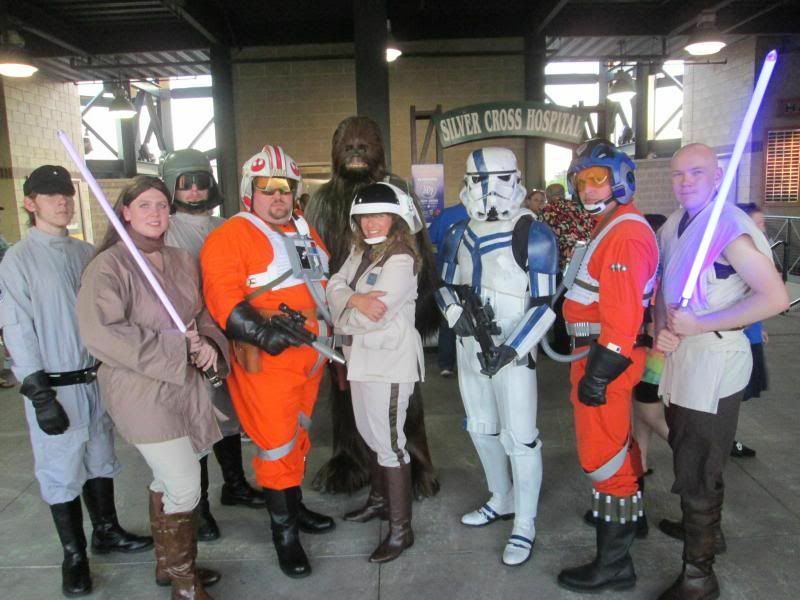 They stayed quite late at the Slammers game but were up the next morning for the Joliet SWD event. For the Slammers game Donella dressed as Jaina (in one of my personal favorite Jedi costumes) and one of her boys dressed in Jedi. Brent and their other son were dressed in their Imperial finery. We in the Illinois portion of NSB lack a great many face characters from the original trilogy, so we were extra grateful to have Donella in Mon Mothma and Brent in Crix Madine. This was a great pairing in the parade. 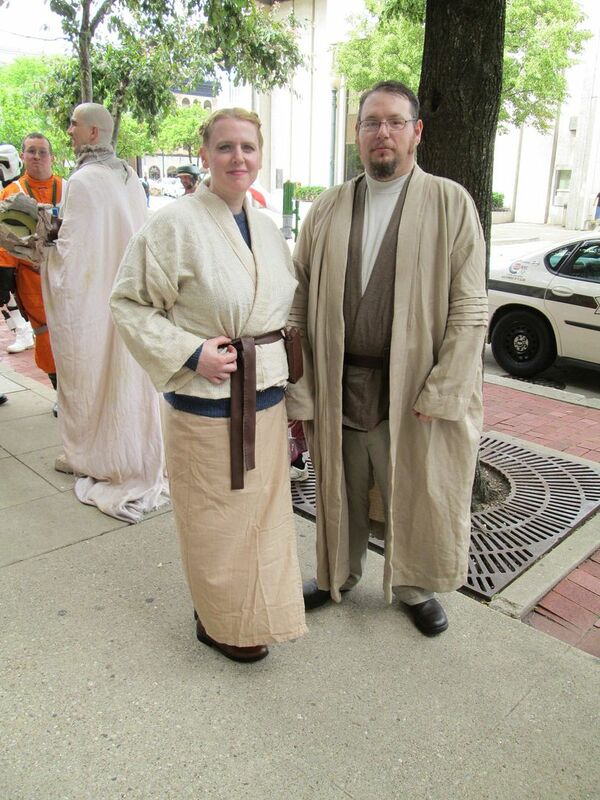 Last year for JLSWD they came as Owen and Beru - another great pairing and one I am always excited to see. Evansville IN is about as far south in Indiana as you can get, it is over 5 hours away from Chicago. Donella and family also made that drive to help us out for the City of Chicago Thanksgiving Day Parade. 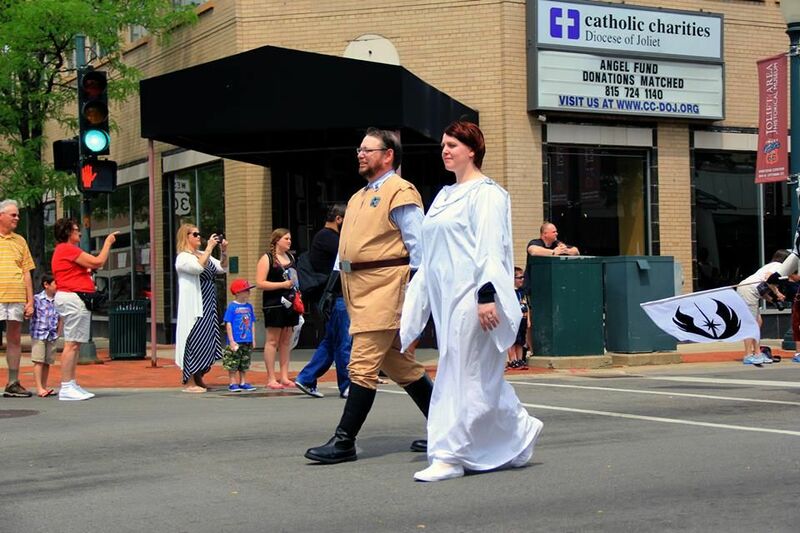 Generally, the Rebellion is short handed at the Parade, so we were extra grateful to have Donella in Classic Leia and one of her boys was in a traditional Jedi costume while Brent marched up with the MWG. Thank you so much for the long drives up to the Chicago area to join us for some of our most "visible" events. You and your family have always added much needed additions to our "presentations" as a unit in the Rebellion. Dan Christy for going it alone and representing NSB at Ethan's 6th BD in Glenview on 5-18-14. 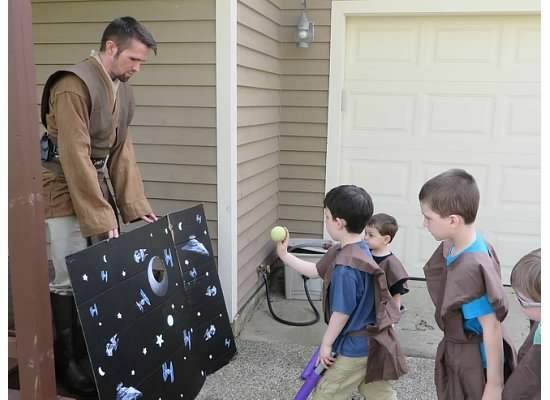 We are all used to seeing birthday party requests for Darth Vader and Stormtroopers, but this time the parents wanted Jedi. Dan took the event and went in alone...something that is always a badge of courage. For his appearance at the party, the Ethan's family donated $100.00 to Make A Wish in our name. Thank you so much for driving down from Madison WI to Glenview IL for this party and for facing the real challenge of doing it solo. From all of us at NSB, a profound thank you....your medal should have arrived....it isn't much...but just a small remembrance and thank you. Rich Heffernan and Austin Buckhalter from Dantooine Base. Like Donella and Brent, Rich and Austin spent Friday 6-6-14 on the road from Missouri and were headed to Joliet for the Library event. Noting also that the ranks were a bit thin for the last minute Joliet Slammers game the night before, they too chose to come out and sweat at Silver Cross Field rather than head for the comfort of their hotel room. Were it not for Rich and the group from Dantooine Base and Donella and her family, Steve M., Patrick Klehr and I would have been a lonesome 3-some at the Slammers Game. We appreciate the extra effort of these folks after a long day on the road. 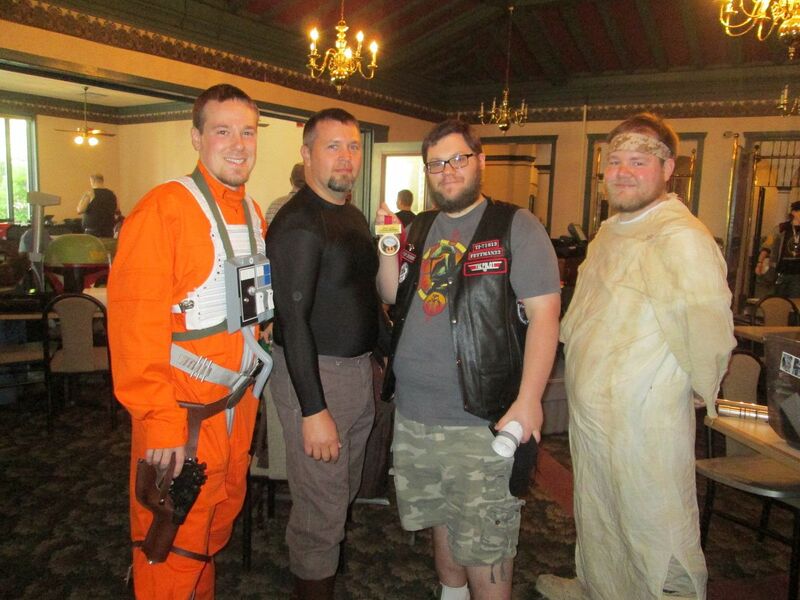 Rich and Austin also joined us the next day in their Rebel costumes for the Joliet Library Star Wars Day. Thank you again for coming up to join us, your participation was greatly appreciated. Samantha has been a member of NSB since 2010. She has been a participant at so many events over the years, many where she has been the "lone rebel". She has done the big events, and the small. For many years, Dylan played the role of the "Lone Rebel" in Central Illinois. 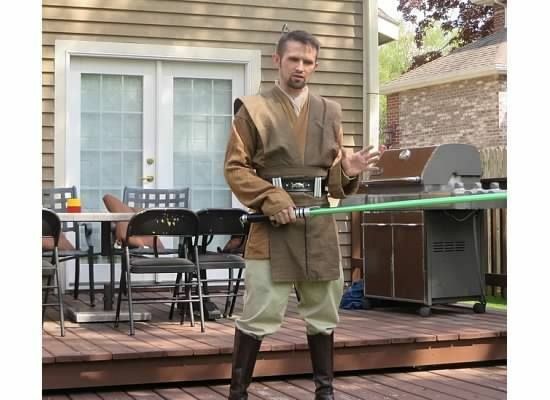 His first costume was a Jedi costume and Dylan appeared at many 501st events as the only Rebel. 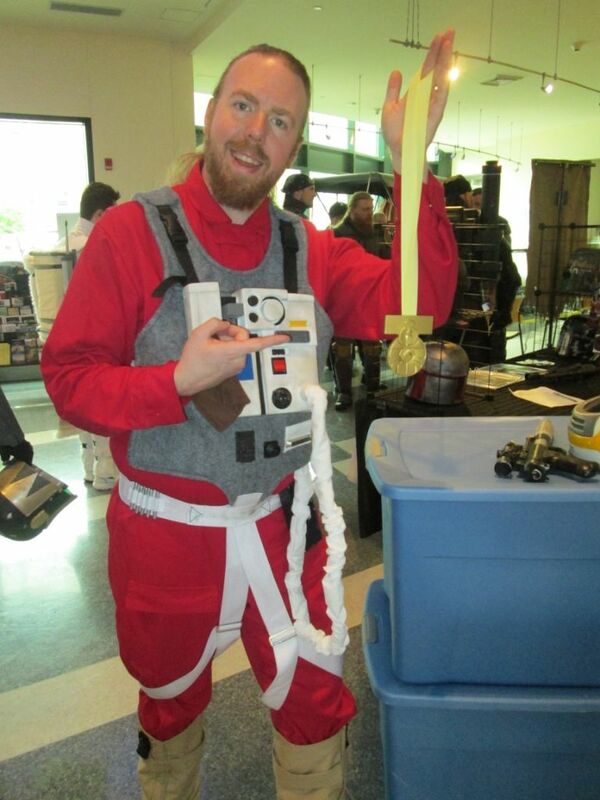 After making his Jedi, he went on to finishing X-Wing Pilot Jek Porkins and then went on to his Endor Rebel Soldier. Dylan is the DCO of Ranger Squad. This year, Dylan took on the challenge of being NSB's point man for C2E2. This endeavor does require quite a bit of time and energy. Thank you Dylan for all you have brought to help spread the word of the Rebellion in Central Illinois. May the Force be with you....always! NSB has added quite a bit of new blood this year...and Laura has been a one of the driving forces in the upsurge. She has come out to a large number of events and has acted as EvCo. Many times Laura has played the role that a lot of us are familiar with...the role of the "lone rebel". It has been a pleasure to have Princess Leia at so many events this year. Jason has also done a whole lot of events since joining NSB. 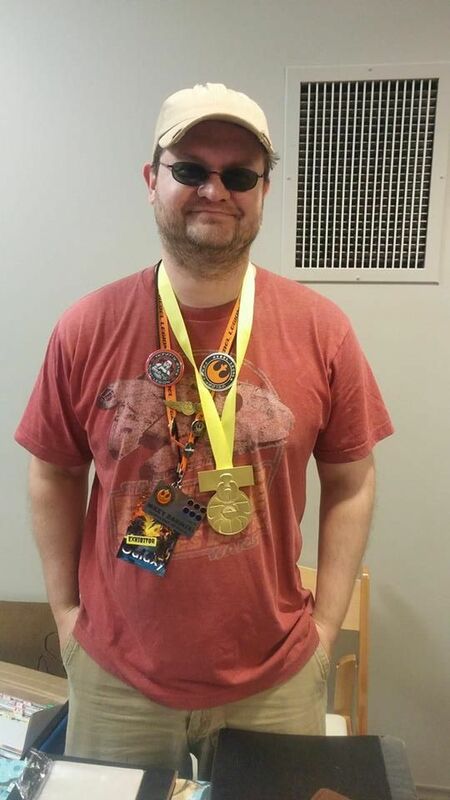 Most recently, Jason took a day off work at the last minute to attend an event at Lurie Children's Hospital so that our lead Jedi for the event would have a "partner". 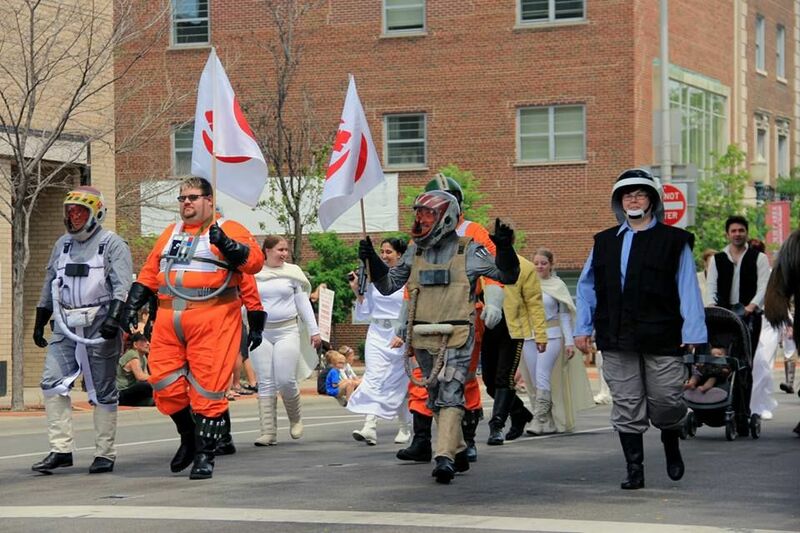 This hospital visit was set up by Disney/LFL as part of the May the Fourth celebrations. 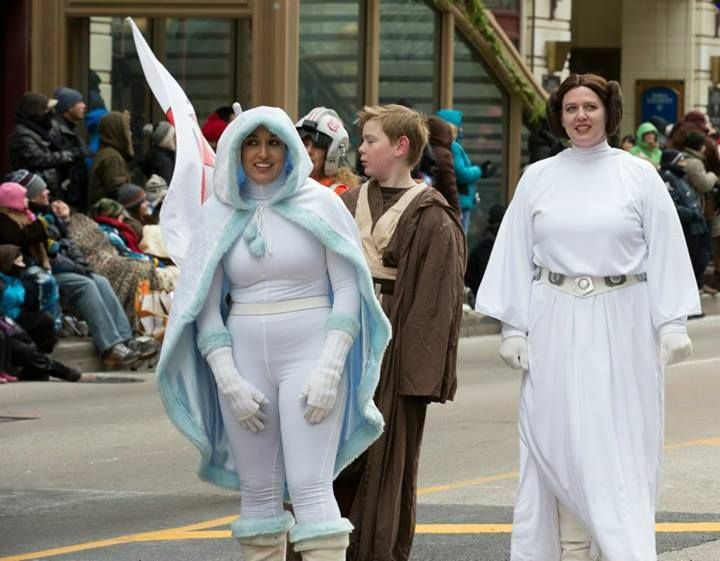 Jedi were the key element/characters for these special events. Jason has also signed on as our PR person and makes sure we have materials at the tables when we need it. 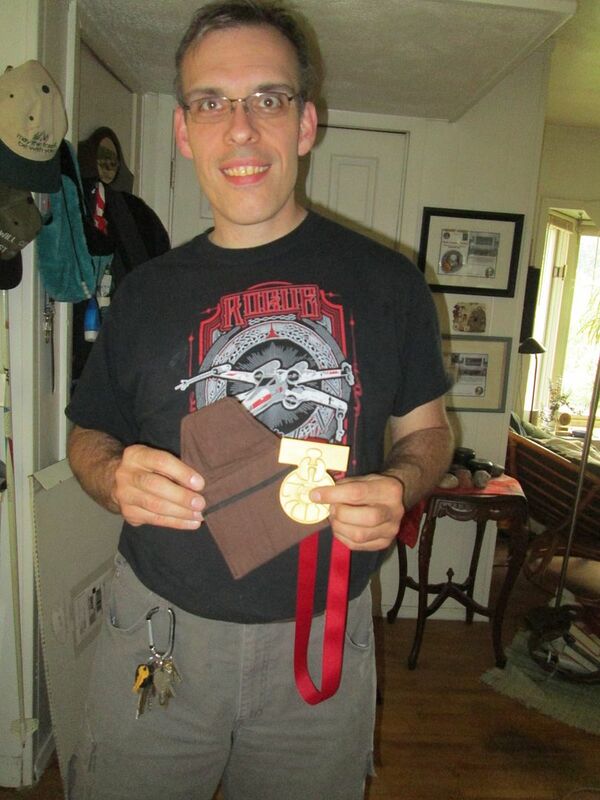 He also burned the midnight oil to finish the B-Wing costume that appears in the photo for our "epic" NSB Outlaw Squadron celebration at the Joliet Library Star Wars Day event. Jason also constructed a gorgeous wooden box to house our MAW boy's lightsaber and power source - complete with the Jedi code. For these and many other reasons...thank you Jason for all you have done for NSB!! Wow...talk about stepping up!! We at NSB are so grateful to have Tim for so many reasons...I am sure I will forget many of them. 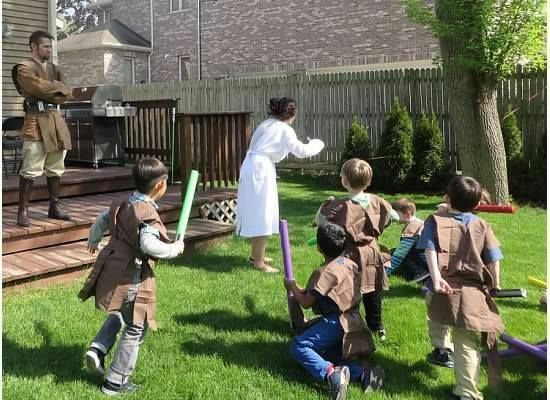 First off, he volunteered to have the "lead Jedi" chores at Lurie Children's Hospital...this is a daunting task! For the Make A Wish event Tim acted as screen writer, director, and did just about everything he could to ensure that our MAW boy had a great day. Included in the many things was paying for and building our Padawan's lightsaber. 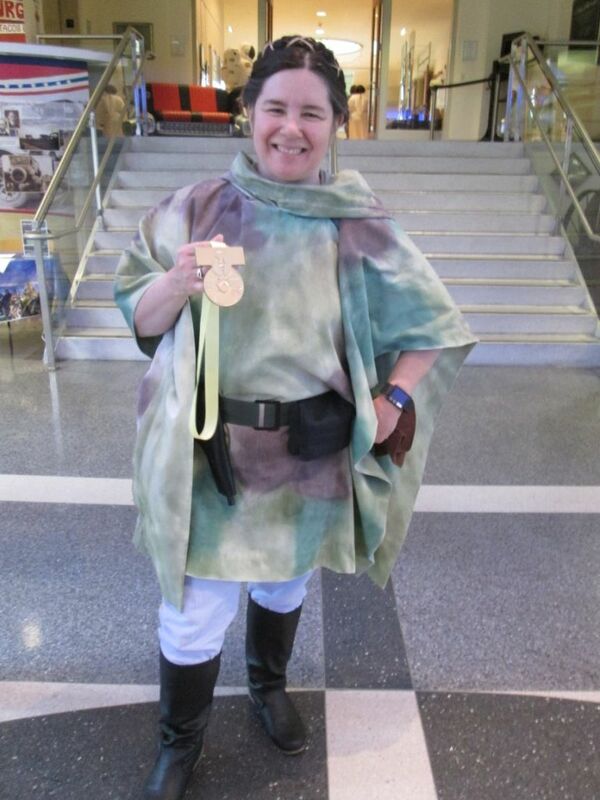 He also constructed the belt and pouches to go with the full Jedi costume made for this event. Tim also stepped up to be NSB's Charity Rep.
Tim also has some tough work hours, but when he has the ability to do events, he does them! Steve is more than that. He has always been there when the chips are down. Has guided us through some turbulent waters and we as a Base are all the better for all that he has done for us. He always puts NSB first and tries to make sure that we members have access to opportunities that are out there. He often spends his own money to make sure that the Base has what it needs to operate. 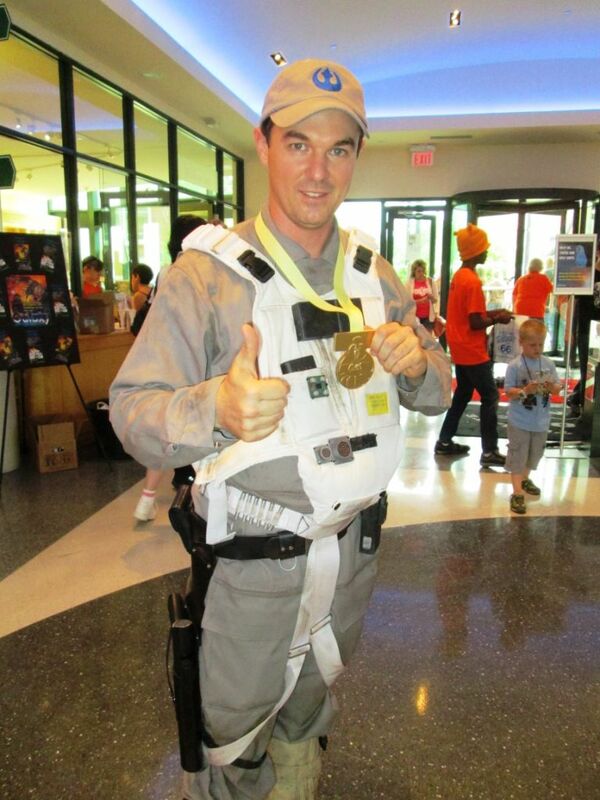 Steve has been EvCo for countless events and has also so often been "the lone Rebel". I can't help but think that the surge of new members we have experienced of late is thanks to Steve. 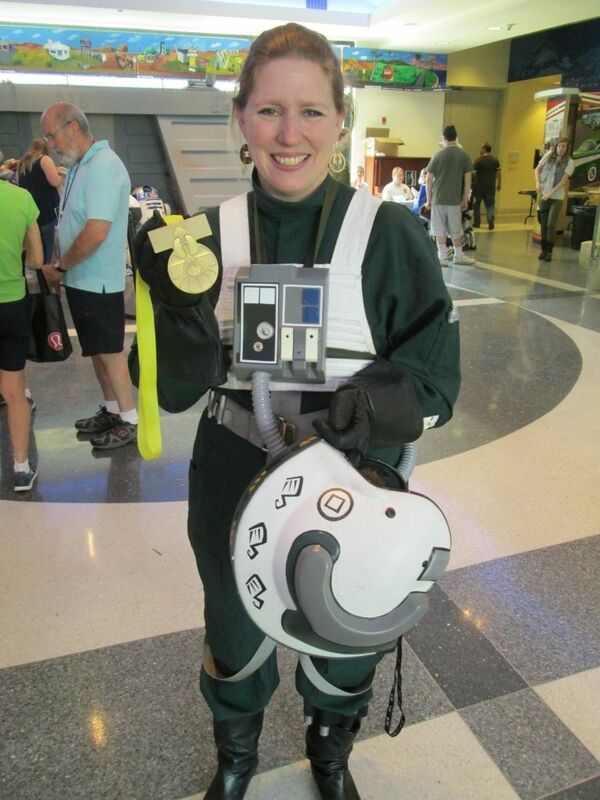 Medal of Yavin #15 and #16 - Scott and Lydia Miller (photo pending). Scott and Lydia have also done all that they can to promote NSB in Central Illinois. They have been visible at many, many events over the last years and have done an excellent job promoting us in the center of the State. They attend a lot of events and act as EvCo for NSB for a lot of them. Scott has also signed on to help with the often mind numbing task of managing event requests. We get so many requests for appearances and it is simply not possible for us to fill a lot of the requests and it is not a happy job to tell people that we have no one for their event. Also, C2E2 represents a huge opportunity for NSB to get exposure to the huge audience of our "peers". Scott and Lydia spent quite a bit of their convention time hosting the NSB table. This can be a mind numbing task and of course, spending time manning the table means that they are not out and about enjoying all of the things that C2E2 offers. You have our eternal gratitude for putting NSB in the best possible light on a very large stage. If it were not for Kim, NSB would probably have little to no merchandise. In the past months, we have had the opportunity to purchase some patches and there will be more to come. We ran out of Outlaw Squadron patches years ago and Kim made a second run of the patches which sold out immediately. NSB has never had Renegade Squad patches and she made a run of those as well. As soon as the Renegade Squad patches are sold out, Kim plans many more runs. If you have never done merchandise, you have no idea what a huge pain it is handling orders and getting things delivered. Also, by virtue of the way NSB generally does all of our merchandise, Kim puts up the $$ for the patches herself and then has to wait till items are sold to get her money back. This keeps NSB stuff fairly hard to get and gives our members "bargaining power" if they are patch collectors. Back in the day, one hardly ever saw photos of the Rebellion at events. We are a smaller group than our counter part and often overlooked. Kim has changed that dramatically as she attends many events with camera in hand and takes lots of photos of the Rebels at events also. Many of us would have no photos of them at events if it were not for Kim. Also, our rag tag bunch of Rebels gets huge exposure on the net thanks to Kim's postings. Handling and uploading photos can be a thankless task and I am sure that I speak for us all that we look forward to her coverage of events. Thanks to Kim, the world knows that we are out there...that is huge! 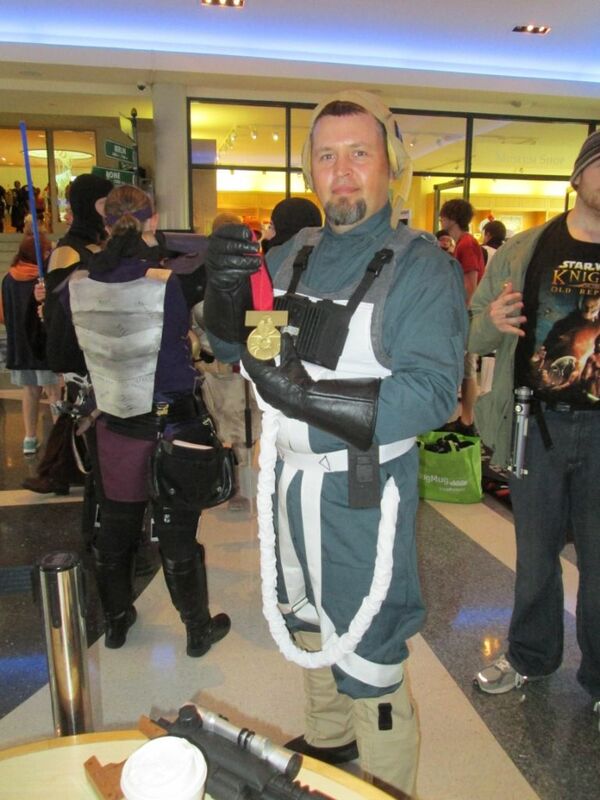 Jim is a local artist and member of the Midwest Garrison. Jim is also a genius at making trading cards. Getting trading cards used to be a real challenge of patience. I know that my first trading card took over 2 years to be realized. Full members of NSB can now get trading cards in a very short time thanks to Jim. Where I don't know Photoshop, I have heard that it can be very time consuming to do and considering the quality of our cards I am sure that Jim spends a LOT of time making our cards look exactly the way we want them. We thank Jim for his efforts, for without his help many folks would probably have no trading cards. Our Commander in Chief now for two years deserves all the medals we can give him. Members who have been around the RL for awhile will understand that Bill has brought a lot to the table in the form of good, solid leadership and a style of command that is firm, but understanding of the diversity of a group that covers the entire planet. I simply can not imagine the amount of time that he spends on the duties of LCO. I have done some Legion-wide duties that are far below that of the LCO and even in the lower level duties I have had, I would often spend a minimum of 2 hours a day on Legion business so I can't even imagine how much time he spends. Bill has also made it a point to try to get out world wide to press the flesh with members and take the pulse of our ever expanding group. Challenges are endless and he meets all of them with grace, dignity and patience. 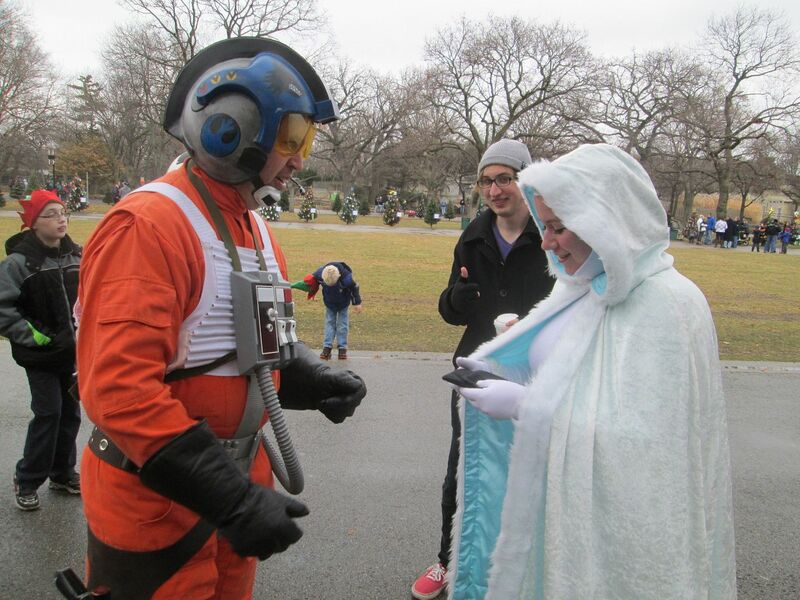 Beginning in 2013, the home of the Rebel Base has been the Joliet Area Historical Museum. That first year the Museum stepped up big time to offer their facilities when the Library could no longer accommodate the ever growing event. Each year they make it a point to provide so much support for the Rebels that we simply could not be a presence without them. They take a lot of time and effort to clear out their lobby, display cases, and have provided the incredible roof top for our after party. They also provide all of the liquid refreshments at the after party. The Museum depends on revenue brought in by the rooftop to help run the museum, but they block the use of that rooftop for us for Star Wars Day. Heather is THE person who makes sure we get all we need and even spent some of her own money to rent the truck that hauled the Bunker to the Museum this year. She also made sure that she provided some of her staff to help with hauling and set up. They also have provided the space for the lightsaber demos done by Nick and John. Comic book artist Mikey Babinski has done so much for the Rebellion over the past several years. He has done one of a kind artwork for use in fundraising which helped raise (this year) over $600.00 for pediatric cancer. 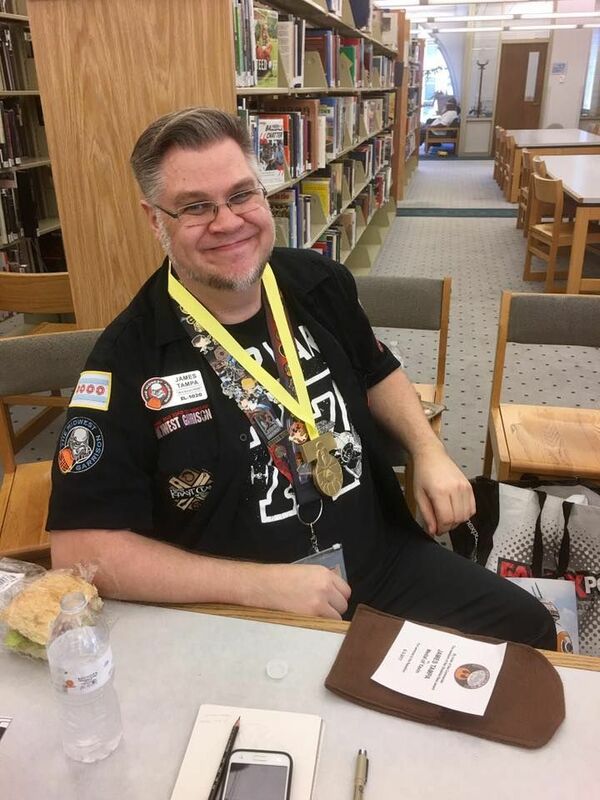 He has always stepped up to help with artwork and even has lent his back in set up and tear down of exhibits at the Joliet Area Historical Museum. Mikey is also an honorary member of Nar Shaddaa Base. These lightsaber battles are not just a "show up" sort of thing. John and Nick lay out the battle on paper first and then put it into motion. They spend hours and hours in rehearsal in order to make there performance as flawless as possible. While others may be able to go out and wander the venue, John and Nick are more or less tied to the auditoriums for their performances. They do multiple performances at each event and not just one. Also, each year for each event they change things up so that repeat "customers" always see something new. 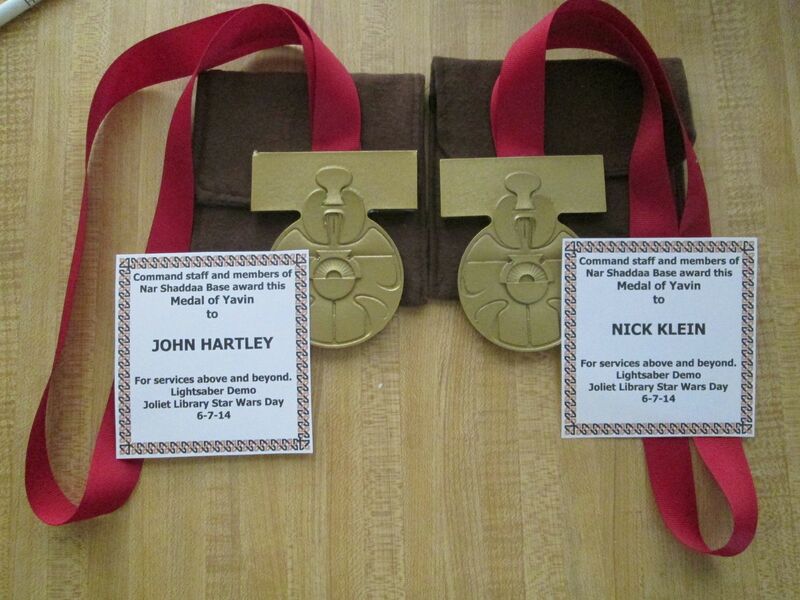 Congrats to John and Nick both. The money you guys raise for charity and the punishment you two inflict on each other for it.....I can think of no more fitting honor for you two. Today she joined us for the Brookfield Zoo Community Tree Trim after appearing yesterday at Navy Pier for the CHITAG charity breakfast. Thank you for all you have done over the years Samantha and we have lots more events ahead. 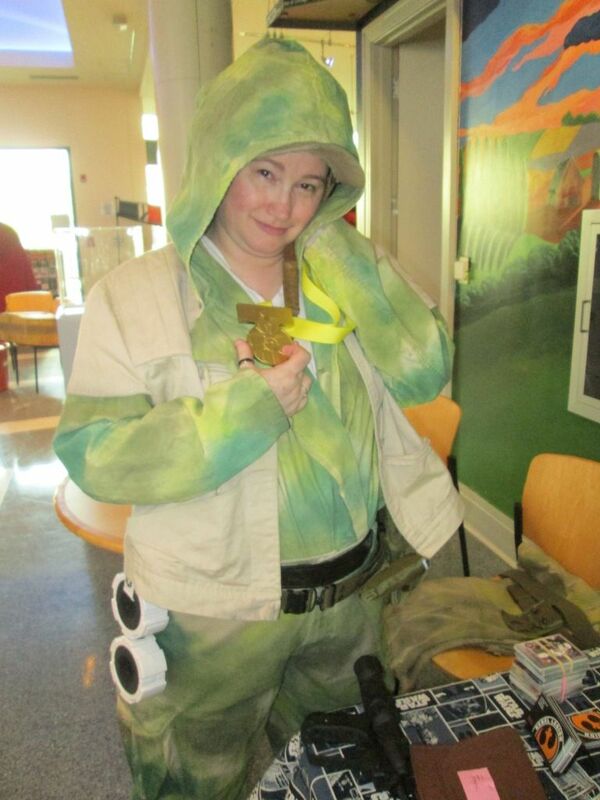 JLSWD saw the distribution of several Medals of Yavin to some of our members. Congratulations to all of them! They often work behind the scenes doing things that everyone benefits from but often take for granted. Congrats everyone! All well desevered!